In my last post, Ling from Singapore asked about how to get started teaching kids yoga. This account of her first class really gives a clear picture of what it can be like to teach real kids, as opposed to adults pretending to be kids in a training course. Here are the ups and downs of her very first yoga class. Thanks to Ling for her honesty and courage as she strives to become a powerful teacher of yoga for kids. 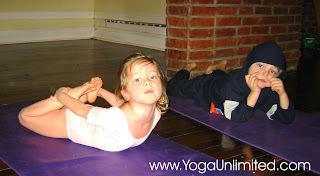 It’s so nice to hear from you, and interesting to see how you got into kids yoga. I myself am from Singapore and finished my teacher training in India (although not in kid’s yoga). A students’ mother actually saw my advertisement on Yogafinder and asked if I could teach her kids and her friend’s kids yoga, so that is how I have started on this path. I personally do not have any restrictions as to what age I should be teaching. I enjoy being around kids and feel like I can really connect with them – and often I just feel like a big kid. Right now I am teaching kids who range from ages 4-7. My first lesson was yesterday. I had planned a list of things to do, but we ended up skipping a whole chunk of it because I realized that time was running short and that the kids were getting restless. I found that they were open to what I taught at certain points, but at other times they drifted off to Pluto, so I had to change a lot of things around to keep them happy. I started the class with introductions of each other (to all the kids) and then began with basic things, like getting them to do the Yoga poses. I was teaching in the living room of one of the kids’ homes, which I thought would be spacious. But, I actually found this location to be quite undesirable because the mothers were hanging around and chatting since they didn’t want to leave their kids. I believe that kids can make noise if they want, or you know just drift off for a little while into their own world; I’m fine with that and still keep my attention on them (basically, just observing them). However, the mothers were not at all happy when they were not paying attention and halfway through the class, a mother interrupted the routines to get her child to drink water and so the kids started moving around and having packet drinks. I felt lost at that moment because firstly, I didn’t want to offend the mothers by saying that we are in the middle of the class, and secondly, the kids were perhaps thirsty, I guess. Overall, the kids seemed to be having a great time, until we came to the relaxation at the end. One of the kids asked me what was I doing at this point, and I guess she did not understand why I wanted them to lie on their backs, relax their bodies, and tell them stories. Also, music. I did not have any music and so the only music was the chatter of the mothers. So basically, I learned a lot from my first day. The location of the class and the fact that the mothers were there is important to consider and plan for. Also, the fact that I did not have music with me and did not explain the intentions behind my choice of activities, are some things I have to consider for next time. So anyway, the class is gonna proceed next week, and I thought of introducing the kids to the different parts of the body and fostering a love for themselves. Thanks to Ling for sharing your experience of your first kids class with us. Actually teaching kids is much different than what we imagine it may be like. It brings up a lot of issues that we have to constantly contemplate on what happened and think of how to improve. You will develop your way of explaining things and find the words that connect with kids. Soon it will become a habit that you don’t even realize you are doing. Like explaining the relaxation. Plus you will build your collection of yoga tools like music that kids like. Click here for some of my favorite music. I also think you made a good decision to move on when the kids were drifting off. There really is no point doing something with the kids if it feels like you are trying to force them to pay attention. You did really well by having a lot of activities planned, that way if something isn’t working you can just go on to the next thing. Kid’s attention spans are much shorter than in adults yoga. The problem of the mothers being in the background talking and popping in and out is something I suggest you address when they are booking the class. You can give them the choice of participating or watching quietly. Or they can llet you teach in one room if they want to have a social time and you can call them if there is a problem. Please keep reading the blog as I will give many more ideas and tips here. I will even use some of your experiences to write some blogs posts. One day I would love to come to Singapore to do a training! Till then, keep your “big kid” spirit. That’s the best tool that you have.